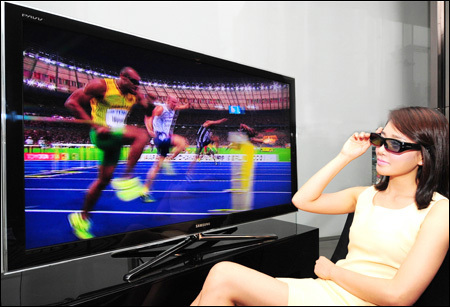 A model wearing special 3D glasses watches a 3D program. The market for 3D televisions needs time to mature in the United States. LOS ANGELES, California ― With the economic recovery progressing, a growing number of American customers are ready to pay more to buy electronics products. Encouraged by positive signs of strengthening consumer confidence, more shoppers are flocking to electronics stores either to upgrade their hand-held devices or to buy new ones. Also among the hot-selling items are liquid crystal display (LCD) televisions with light-emitting diode (LED) backlight. So far, analysts have been forecasting a greater growth potential in the LED TV segment, as it is quite unclear whether the few premier buyers would be willing to pay to obtain pricier and software imperfect three dimensional (3D) televisions. LED-backlit LCD televisions are on a smoother course in the U.S. market, the world's biggest consumers of electronics. Meanwhile, LED backlighting enhances black levels as well as contrast, making it possible to provide energy efficiency and a longer life for the television. ``We are receiving more customers making inquiries about the details of LED-backlit LCD televisions. We've seen a rapid sale increase in LED TVs and other electronic products that use LED as backlight over the past few months,'' said Cynthia J. Park, an employee at an electronics store near Wilshire Blvd. Park said a series of promotional campaigns during the Independence Day holiday did pay off and further price cuts are expected. A manager at the Best Buy store in downtown Los Angeles predicts the prices for LED-backlit LCD TVs to fall. He said the enhancement of television technologies will minimize the motion blur in most LCD televisions. ``Thanks to marketing, the recognition of LED-backlit LCD televisions have increased at a faster pace,'' according to the manager. Best Buy is the biggest specialty outlet of consumer electronics goods in the United States. Samsung and Sony's 120Hz 46-inch LED-backlit LCD TVs are both selling at $1,399.99. For its 240Hz 46-inch LED TV, Samsung's asking price is $300 higher than Sony's. Samsung Electronics and LG Electronics are leading the North America's LED TV market, taking up a combined share of over 80 percent, according to market research firms. In order to find new growth revenue in the highly-competitive flat-screen television market, the two have been aggressive in pricing and marketing strategies to sell more of their LED televisions in developed markets over the past few years. Sharp and Sony, two Japanese leaders in consumer electronics, had a 2.9 percent and 2.0 percent share, respectively, last year, according to official data. LEDs usually consume less power and last longer than conventional light sources. LED applications are increasingly used in consumer products such as mobile phones, flat-screen TVs, traffic lights and public information screens. The market for 3D televisions in the United States has just taken off, though awareness of the technology has mainly been raised because of the World Cup. Price is the biggest drawback, followed by suspected health risks and content issues, sources told The Korea Times. ``It's intriguing to see quite a few consumers ask about the advantages of 3D televisions. Interestingly, they are usually shocked by the high-end prices,'' said a clerk who works for a Best Buy store on Weyburn Avenue, Los Angeles. Though 3D televisions are offering the best TV technologies that only top-tier manufacturers such as Samsung, LG and Sony can give, Samsung's top-featured 3D model ― the 55-inch LED-backlit 240Hz ― is priced at a staggering $7,000. ``I cannot find firm strengths to persuade customers to buy the sets,'' a sales representative said. ``I'd recommend customers to buy when it comes down to less than $2,000,'' he said. A market research firm In-Stat said 3D TVs will account for 20 percent of sales in the United States by 2013. A customer who identified himself as Jerry said his family is aware that 3D TVs may cause eye fatigue and other health-related problems. ``Watching 3D programs on TV is exciting but I will not buy it,'' he added. 3D has captivated the imagination of people worldwide due to the success of the movie Avatar. When watching such digitized programs on TV, users are required to wear special glasses. Moreover media companies are not yet ready to produce more content. Facing the lack of 3D-related content, Samsung Electronics, is strengthening its conversion technology, turning two-dimensional signals into 3D. Samsung began selling 3D TV sets in the United States in March this year. Meanwhile, Choi Joon-hyuck, a spokesman for LG Electronics said his company plans to sell 10,000 3D TVs in the South Korean market before launching them in the United States. The global shipments of 3D TVs will increase to 4.2 million this year and to 12.9 million by 2011. In 2015, the market for 3D televisions will spike up to 78.1 million units, according to the forecast by iSuppli, a market research firm. The demand for all types of LCD TV sets will increase to 170 million this year, with LED set sales reaching 26 million.